Adding long lasting perennial shrubs to the yard is a great investment to your property. When I had my taxes done this year I was told to keep receipts of any improvements I made to the yard, including landscape plantings and other upgrades. Since I have a yard that needs a lot of help, I like the idea that I can claim at least some of my hard work on my taxes next year as a home improvement. Have you ever looked at houses you pass while driving and thought how much the look could be improved by adding some nice looking perennials? I realize that not everyone is a gardener but it’s a shame people don’t care to make the outside of their house look lovely. It’s the first thing everyone sees and plantings make a home more inviting, in my opinion. Hire someone to do it if you don’t want to. Adding colorful perennials to the yard takes money and work, but the lasting appeal far outweighs the initial investment. Comparison shop for deals on your favorite flowering shrubs and buy something that needs little to no care once it’s planted (unless you like to fuss over roses!). I love hydrangeas because they are fuss-free for the most part, but another plant to consider is the Rhododendron. 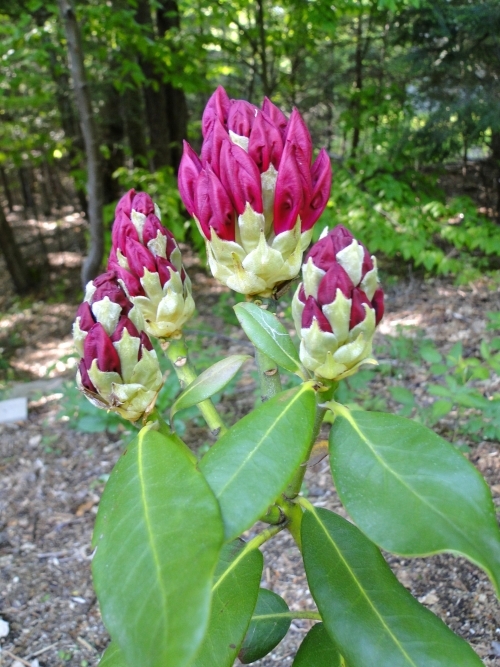 The large version comes in a variety of flower colors and this red one (pictured) is my favorite. They like some shade, but this is a very hardy plant that will grow large. The smaller version, which looks more like an azalea to me, is also easy to grow and gets an abundance of flowers. The only issue I’ve had with this one is that something ate the leaves – deer maybe? Buying perennials in Fall will save you money, and over the winter they will have the chance to settle in and get ready to bloom in spring or summer the following year. Adding just a few flowering perennials to the yard will make a big difference and will continue to enhance your landscape for years to come. Previous Post Buying Is Fun, Planting – Not So Much! Next Post The Pinky Winky is Planted!